This is how my husband describes classy people and places. When I hear this word, I imagine guys in khakis and sweater, or women like Jackie O. Sorry but I don't think of Victoria Beckham, maybe David, but not Posh Spice. I also relate posh with nice things British. And there's nothing more British than afternoon tea. 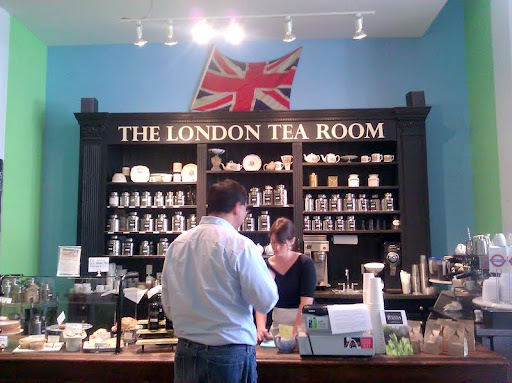 So when I discovered the London Tea Room in downtown St. Louis, I immediately said this is quite posh. Although afternoon tea in England is meant more to fill in the gap between meals, I had lunch at the Tea Room. 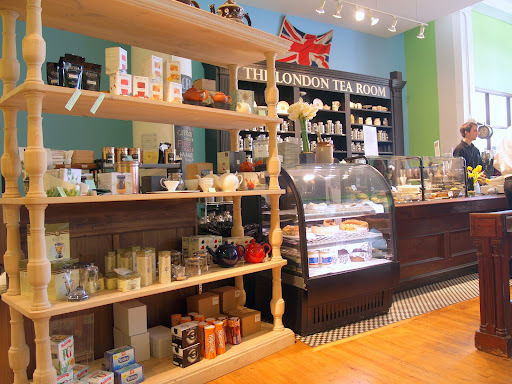 The London Tea Room is our next stop for my blog's feature on: All Good Things St. Louis. 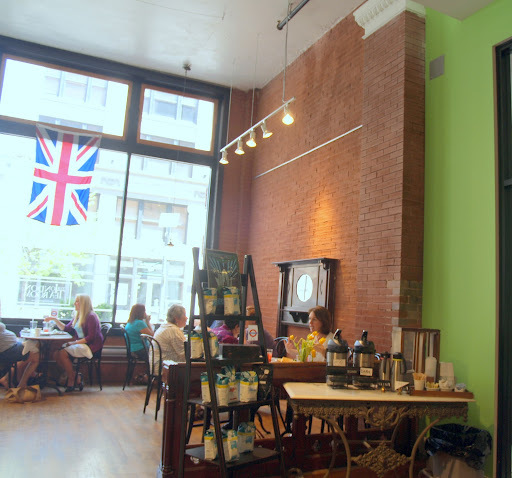 The London Tea Room is located in the Washington Avenue Loft District in downtown St. Louis. The high ceiling gives you a loft feel but the walls done in pastels and the traditional farmhouse tables and cupboards traded the industrial feel to a warm and friendly Tea Room. 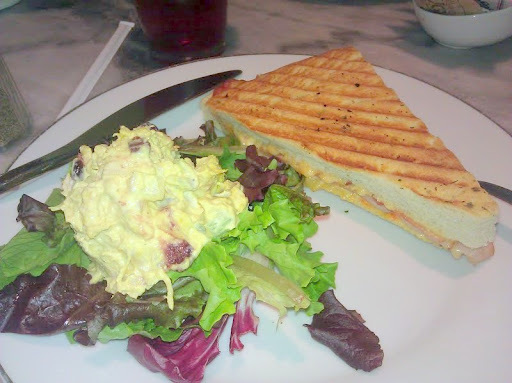 I ordered a turkey-bacon panini with a waldorf salad. The salad was a surprise, it had a hint of curry, which I truly enjoyed. 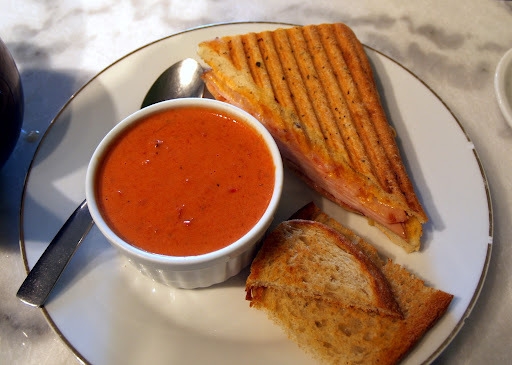 I also tried their tomato bisque, which was refreshingly not as thick and creamy as others I've tried. 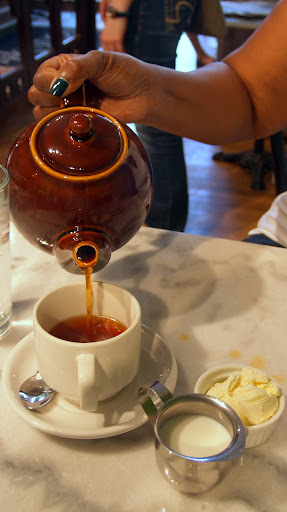 Of course I savored on the English blend tea with clotted cream (or heavy cream). You'll have to request for this specifically, and the server was surprised that I requested for it as they usually serve it with scones. This is also the perfect place for afternoon tea, as they sell scrumptious pastries. A slice of their decadent chocolate cake is to die for. They also serve scones and tea cookies but I need to try them on my next trip. Overall I was delighted as a first time customer that I found myself going back there on the same week. 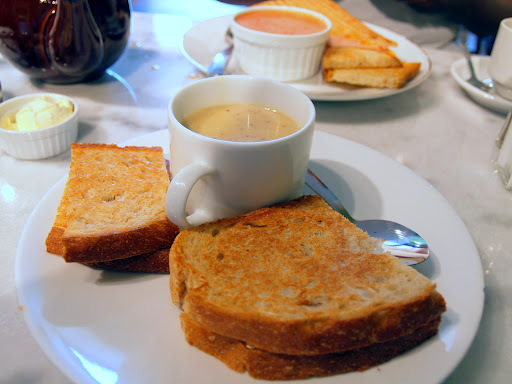 The London Tea Room is now one of my go to places for a light lunch or afternoon tea. Although we do not consider being an integral part of the British empire, afternoon tea is one English custom that we can still all enjoy. Now who's up for the season finale of Game of Thrones? haha! Have a great weekend! Great timing as today is the celebration of the Queen's Jubilee. We have afternoon tea with my friends here in Highlands Ranch too and how we love doing it. As Christian said it's posh. Perfect timing indeed. Great to know that you have your afternoon tea with your girlfriends. That sounds like fun. 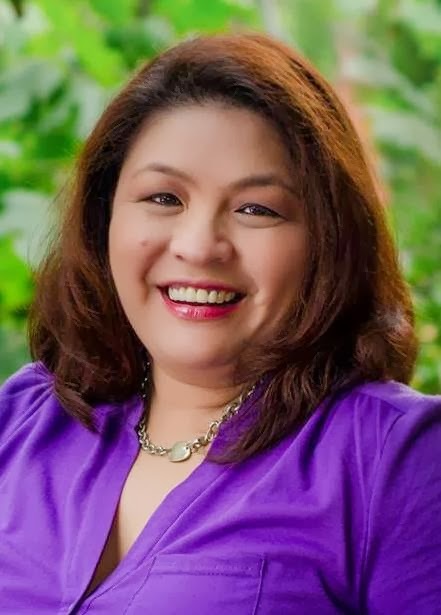 Hi Malou, I'm glad you are enjoying your new city. We don't have a Tea Room here in Melbourne like what you have there in St. Louis. I still don't have Facebook but I'm glad to read all your posts here. I hope to talk to you soon. Thanks for dropping by. Im glad to know you are following me in my blog. I'm sure we would have done something similar if we had something like this in FL. I miss you girl! Pardon my ignorance I automatically assumed that the curry made it Brit haha. No seriously a friend of ours said that CUrry is the most popular food in Britain. haha. Hi Malou. I thought for a while that you were in London. I'm glad you have something like that there for days when you feel like having a proper cuppa. There is an English chicken mayo with curry powder called Coronation chicken (first made for the celebration of the of coronation of Queen Elizabeth). This is probably what inspired the twist on their Waldorf salad. thank you for sharing that info Adora.. right from the grapevine so to speak. I'm sure you guys have so many guests coming for the Olympics huh? Nothing better than scones, jam and clotted cream for afternoon tea. There's a tea room not far from me called The Two Old Ladies Tea Shop where they have the most wonderful high tea every afternoon. I've only been once but I could go every week if my waistline would permit. I went twice in a week but the next trip will be 20 years or 20 lbs off from now.. which ever comes first haha. 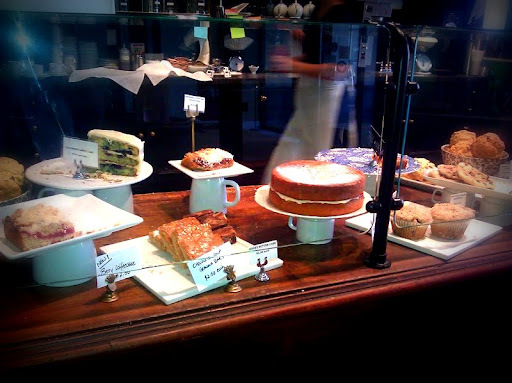 There is something so civilized about afternoon tea - we have a few tea places that serve some goodies. But that tomato bisque - oh that looks heavenly - so deeply red. I'd love that.